I’ve always wanted to make my own Fil&#233 powder from scratch but didn’t have access to a Sassafras tree. Last fall I found a tree near my home here in Michigan, but never got around to harvesting any branches, so I took care of that today. It will be interesting to taste true, pure Fil&#233 powder, as most store bought varieties have some kind of addition such as Thyme. 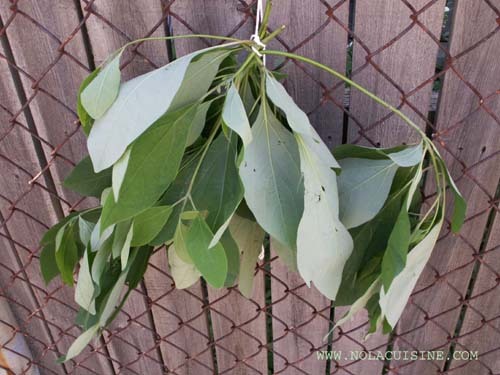 When looking for a Sassafras tree look for leaves as seen below, with smooth edges. There is a weed here in Michigan that looks very similar, but has jagged edges. Some sassafras leaves are mitten shaped, some have 3 prongs, and some are football shaped. If you can get to it’s roots they will smell strongly of Root Beer. More to come on this topic when my Sassafras leaves are totally dry. Bill Moran is my friend, too, and I’m sure he’s right! As a young Boy Scout in Louisiana we used to dig up young sasafras trees for their roots, strip them of their woody outer layer and boil them in water to make tea. Root beer flavored tea. The sasafras tree was a favorite on the Nature Trail because you could identify it by the three different kinds of leaves, single lobed to triple lobed. Sasparilla is a root beer flavored drink made from sasafras tea and carbonated. My yard is full of sassafras seedlings which I cut down whenever I have time. If you need more leaves, let me know and I’ll send you some. 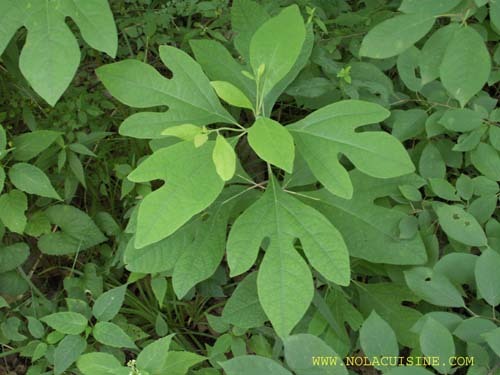 I would like to have some Sassafras seeds or leaves to make my own File Powder , Would you send me some . Bill Farrell wrote that “Sasparilla is a root beer flavored drink made from sasafras tea and carbonated.” I just thought I’d correct that–root beer itself used to be made from sassafras, though with the FDA restrictions on sassafras root it’s now mostly artificial or mocked up from other spices. But sarsaparilla is made from the sarsapirilla vine, not from sassafras. (And birch beer is made from birch). I lost my beautiful sassafras tree last year of old age. Do you know where I can buy a new one? I really miss its fall beauty. the real deal without file`… ya-ya gumbo ! I would like to get two of these trees. Where can I buy them, maybe as seedlings, in Louisiana? I have sassafras seedlings in my yard that I am going to pull out and toss in the compost pile. If you want a few, let me know. I live on Long Island off New York. Would like to obtain a sasafras tree as a gift. Where can I get it? Just found your comment from September 30. How do I contact you to get a couple of trees. I wish I could identify sasfras trees,But I cannot.if someone would send me seedlings I would appreciate it. No, the leaves do not contain the carcinogenic Safrole like the roots do, so it’s still ok to make and sell filÃ© powder from the leaves. I’m all out of it so I’m going to hunt for some leaves this weekend at a friend’s house.